LAKE ELSINORE, Calif. (AP) — Firefighters fought to spare homes Friday from a growing Southern California forest fire, a day after flames came perilously close to neighborhoods and destroyed one house. Gov. Jerry Brown declared a state of emergency for Orange and Riverside counties as the fire carved its way along ridges in Cleveland National Forest south of Los Angeles. Aircraft dropped fire retardant on flames and homes as people ignoring evacuation orders used garden hoses to spray down their properties when the blaze flared Thursday evening, propelled by 20-mph (30-kph) gusts. One resident wasn’t so lucky. Standing in the ashes of his burned home on Friday, Dan Pritchett told KNBC-TV that he and his brother stayed until a wall of flames roared near. Along with Pritchett’s home, the Holy Fire burned 12 cabins at its origin in the community of Holy Jim on Monday. It had grown to nearly 30 square miles (77 square kilometers) by Friday night. However, firefighters also doubled their containment from 5 to 10 percent. It’s one of nearly 20 blazes across California, which is seeing earlier, longer and more destructive wildfire seasons because of drought, warmer weather attributed to climate change and home construction deeper into forests. Visitors should expect limited hours and visitor services next week as the park returns to normal, he said. The blaze didn’t reach the heart of the park and instead burned in remote areas, making roads inaccessible and polluting the area with smoke. Officials also gained more control over two other major Northern California wildfires, including the largest in recorded state history, even as evacuations were ordered for communities near a new fire in the Fall River Mills area, about 70 miles northeast of Redding. About 350 residents were under mandatory evacuation orders because of the Hat Fire, which began Thursday near a highway. The fire was deliberately set. A resident of Holy Jim has been charged with arson and other crimes and appeared in a jailhouse courtroom Friday. Crews turned a corner in their battle against Northern California’s Mendocino Complex Fire, the largest-ever in recorded state history, getting it 60 percent contained. 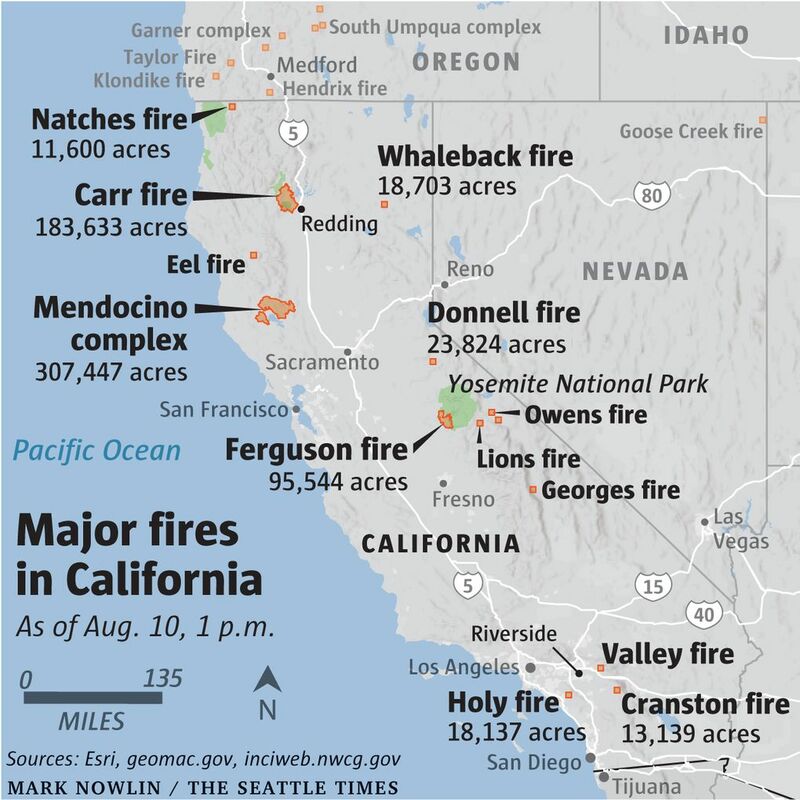 The fire more than 100 miles (160 kilometers) north of Sacramento has destroyed more than 100 homes and blackened an area about the size of Los Angeles. Near the Northern California city of Redding, the year’s deadliest fire was nearly half-surrounded and was burning into remote and rugged forest land. The Carr Fire has burned more than 1,000 homes. Air quality has been another problem. A smoky haze stretches from the foothills of the Sierra Nevada range to Sacramento and hovers over the San Francisco Bay Area, with most major population centers in between enduring air quality that’s considered dangerous for many residents. The size of the fires brings new horror as the state still reels from enormous blazes last year and has yet to hit its most dangerous months historically.